ELOY, Ariz. -- An attempt to set a world skydiving record by having more than 220 people free-fall from an airplane in formation turned tragic Thursday when one jumper died during the daring effort at the same Arizona location where two skydivers fell to their deaths last year trying to set a different record. 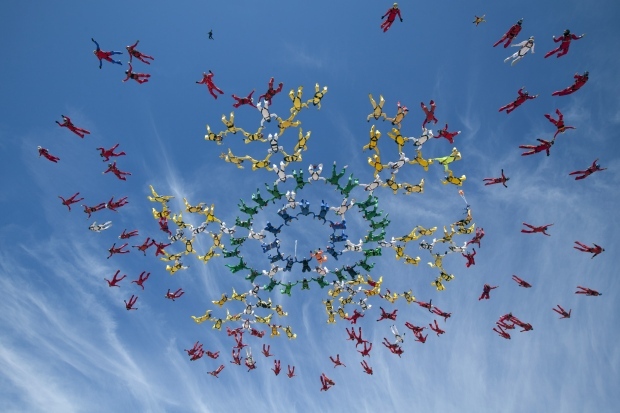 The group of 222 people from 28 countries was to free-fall from about 18,000 feet (5,486 metres) then come together in a formation like a snowflake and separate and link in another formation before pulling their parachutes. The skydivers hurtle through the air at speeds of more than 100 mph (160.93 kph), and they have about 70 seconds to complete the free-fall formations before they must deploy their parachutes. "Our dear friend cannot and will not be replaced," said Gulcin, whose group organized the record attempt. "The group will continue to hold the slot open in the skydiver's honour." Two skydivers -- from Germany and the United Kingdom -- died in November as their parachutes collapsed and they fell to their deaths during an attempt to set a different jump record.